T.M.X. trouble: Elmo is stolen! 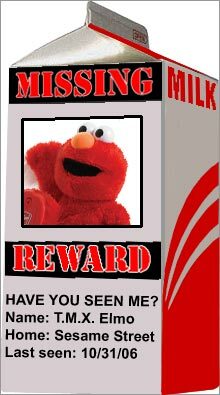 Wal-Mart says 100 units of the hottest holiday toy went missing en route to the store; offers reward for Elmos' return. NEW YORK (CNNMoney.com) -- Wal-Mart is seeing red over a missing shipment of T.M.X. Elmo, a frontrunner for this year's hottest toy. The world's largest retailer wants the missing Elmos back as soon as possible and declared that it will "do whatever it takes to ensure [Elmo] gets to shelves this holiday season." In a statement emailed to CNNMoney.com, Wal-Mart (Charts) spokeswoman Jolanda Stewart said the shipment, containing more than 100 T.M.X. Elmo dolls, went missing on Oct. 31 en route to a Wal-Mart store in Bentonville, Ark. "We're continuing the search for them," she said. Wal-Mart is also offering a trip to a comedy club in New York City as a reward for returning the shipment. However, officials at the Bentonville police department told CNNMoney.com that they were not currently aware of any missing Elmo report from Wal-Mart. Fisher-Price, a division of No. 1 toymaker Mattel (Charts), unveiled the new T.M.X. Elmo to the world in September. Industry watchers pegged T.M.X. as the hottest toy of the year and suggested consumers get the toy while they can because they expected an extreme shortage of Elmo over the holiday shopping season. For its part, Wal-Mart said while many retailers are concerned about having the item in stock, it still expects to receive weekly shipments of the toy over the holidays. But Marshal Cohen, chief retail industry analyst with market research firm NPD Group, said the missing toys could turn into quite an embarrassment for Wal-Mart. "It's a really big deal for Wal-Mart," said Cohen. "T.M.X is the hottest product is has in its stores right now. So suddenly the missing Elmos make the toy three times more valuable to Wal-Mart than its original retail price." "The other problem for Wal-Mart is that it really can't afford to have consumers read about the missing Elmos and then avoid its stores and go to the competitor in hopes of finding Elmo there," he added. Anxious parents can also hope to score an elusive T.M.X. Elmo at Wal-Mart's rival Target (Charts) and other toy stores such as Toys 'R Us and online merchant Amazon.com (Charts). Wal-Mart: 'Cheap' better than 'chic'?